The global automotive steering system market has been covered under the scope of this report. The rising demand for automobiles globally and the demand for effortless maneuverability of vehicles has propelled the growth of companies which manufacturer’s automotive steering systems. Steering system is a core element a vehicle; it directs the vehicle and helps to avoid obstacles and take a turn.. A steering system is the direct contact of the driver with the vehicle. An automotive steering system is the most vital component of any vehicle as it is the direct line of control and communication between the driver and the vehicle. An automotive steering system consists of various parts such as steering wheel, steering column, intermediate shaft, tie rods, and hydraulic pumps among others. Global automotive steering system market is primarily driven by the growth in demand of automotive sector in emerging markets and increasing demand fuel efficient vehicles. Automotive sectors are witnessing high demand for automotive steering systems in developing countries such as China, India, and others. The market in these regions is mainly driven by fuel efficient vehicles and demand effortless maneuverability of vehicles. Considering all these positive impacts, demand for automotive steering system is set to rise during the forecast period from 2015 to 2021. 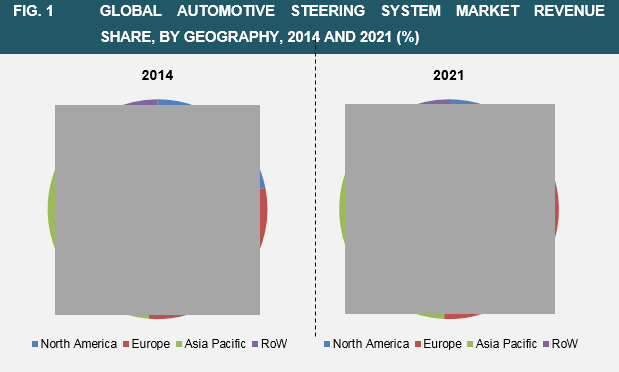 The global automotive steering system market has been broadly segmented into four regions, North America, Europe, Asia Pacific and RoW (Rest of the World). In terms of revenue, Europe held the largest share of the market in 2014 followed by North America. Increasing purchasing power of the consumers is also driving the market for automotive steering system. In addition, the increasing vehicle production in all regions of the world is also influencing the demand for the automotive steering system market. Electro-Hydraulic Power Steering is becoming largely popular in the automotive steering system market because they converge the advantages of both Hydraulic Power Steering and Electronic Power Steering and delivering the best results. Electronic Power Steering Systems are much more fuel efficient and easy to handle. Most of the passenger vehicles and streets cars have Electronic Power Steering Systems. This system is driven by an electric motor which is independent from the main engine and only operates when it is needed. Hydraulic Power Steering systems are the most basic and hassle free design among steering systems. The steering system provides assistance to the driver to steer by providing hydraulic assistance to the steering mechanism. So the drivers just have to put a modest force to the steering wheel while the hydraulic system does the rest The major concern of the industry is the huge capital that is required for research and development of steering system, which increases the price of the automotive steering system considerably. Germany and the UK are the leading manufacturers in the automotive sector in the Europe region. The increasing advancements in automotive technology have positively impacted the demand for steering systems in the region. Automotive steering systems are considered to be the main line of control of the driver with the automobiles. Therefore, the demand for automotive steering systems is set to grow in the region with the change in lifestyles and increasing purchasing power of the consumers.